Newly acquired wide receiver Odell Beckham Jr. is thankful for opportunity to play for the Cleveland Browns and ready to build his legacy. On Tuesday, Odell Beckham Jr. took to Instagram to provide some hype for the Cleveland Browns' 2019 season. Looking for a Tuesday afternoon pick me up? If you're a fan of the Cleveland Browns, Odell Beckham Jr. may have provided just that. Taking to Instagram, the Browns' new star receiver posted a one-minute-long video set to "Legacy" by Offset, Travis Scott and 21 Savage that was filled with highlights of himself and two of his new teammates: Cleveland wide receiver Jarvis Landry and quarterback Baker Mayfield. "Them DAWGSSS gon be on go!" Beckham's caption read. "Ion care what u talkn bout 😤😤 finally get to be off my leash #CountMeIn." In the span of just one hour, Beckham's post has been viewed more than 347,000 times while receiving more than 133,00 likes. It was made by Thunder Productions Multimedia, which has previously made hype videos for athletes such as Mayfield, Heisman Trophy-winning quarterback Kyler Murray and Houston Rockets guard James Harden. Last month, the Browns sent shockwaves through the NFL when they acquired Beckham in a blockbuster trade with the New York Giants. Considered one of the most dynamic wide receivers in all football, the 3-time Pro Bowl selection totaled 390 receptions, 5,476 yards and 44 touchdowns in five seasons with the Giants, including 77 receptions for 1,052 yards and 6 touchdowns in 12 games in 2018. 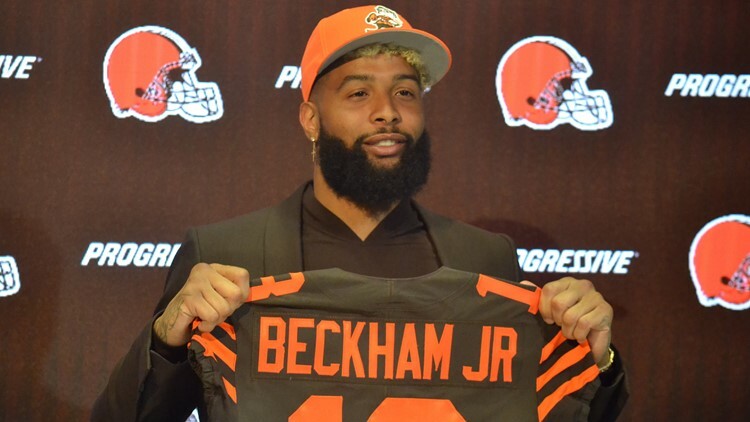 Sitting alongside Mayfield, Landry and Pro Bowl defensive end Myles Garrett, Beckham was officially introduced as a member of the Browns at a press conference at the team's facility in Berea last week.